I stand corrected about the water pipeline work, which seemed to reach its mainstay on Jan. 12, 2018. Two days ago, Burtech contractor crews started to earnestly tear up our street, compelling closed apartment windows that keep out noise and dust and, disappointedly, pleasant weather. My repast has been longer walks, to parts of the neighborhood where the natural sounds of birds, other wildlife, and breeze rustling palm fronds are soothing ambience. 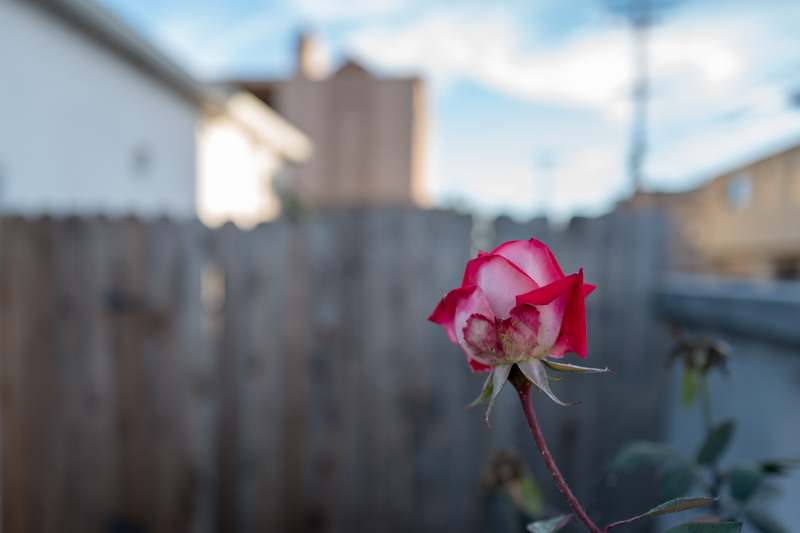 This afternoon, while walking down Meade Ave. towards Texas Street, I passed a lone rose rising defiantly behind cement wall, challenging the urban, human landscape’s listless, lifeless incursion. The flower emboldens my hope that the birds, cats, squirrels, and other wildlife—driven away by diggers, jackhammers, saws, and the incessant beeping of large commercial vehicles backing up—might one day return. I don’t begrudge the construction, for its purpose is important: replacing pipes that will deliver fresh water to University Heights’ residents. I merely long for work to finish faster. I shot the Featured Image at 4:07 p.m. PST, using Leica Q‘s dedicated Macro mode. I cropped out annoying electrical boxes, but largely maintained the composition as shot. Vitals, with aperture manually set for better bokeh (e.g. blurred background because of shallow depth of field): f/2.8, ISO 100, 1/400 sec, 28mm. The edit pulls back contrast, exposure, highlights, and blacks but boosts saturation, shadows, vibrance, and whites.